and can be guided by a magnetic field. 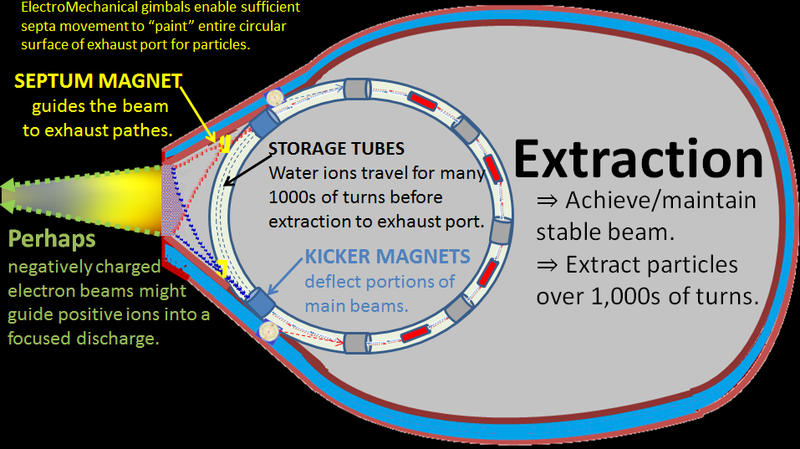 Thought Experiment's (TE's) notional spacecraft uses a particle accelerator to bring fuel particles to very high speeds. At such velocities, a relatively small mass of exhaust particles could accelerate a larger spaceship at g-force to simulate gravity and gain enormous speeds. Particle accelerators have been around for a hundred years; thus, TE assumes a space borne, particle accelerator, propulsion system will be designed, constructed, and operated; and it will provide g-force powered flight for extended voyage durations (days and weeks). This chapter briefly covers a few accelerator concepts; perhaps someday, spaceships can leverage these concepts to achieve g-force propulsion. 1. Plasma Source. Plasmas are freely moving charged particles, i.e., electrons and ions; plasma can form at high temperatures when electrons are stripped from neutral atoms. Plasma is by far mass's most common state in nature; stars are predominantly plasma, and stars contain the vast majority of mass in the universe. 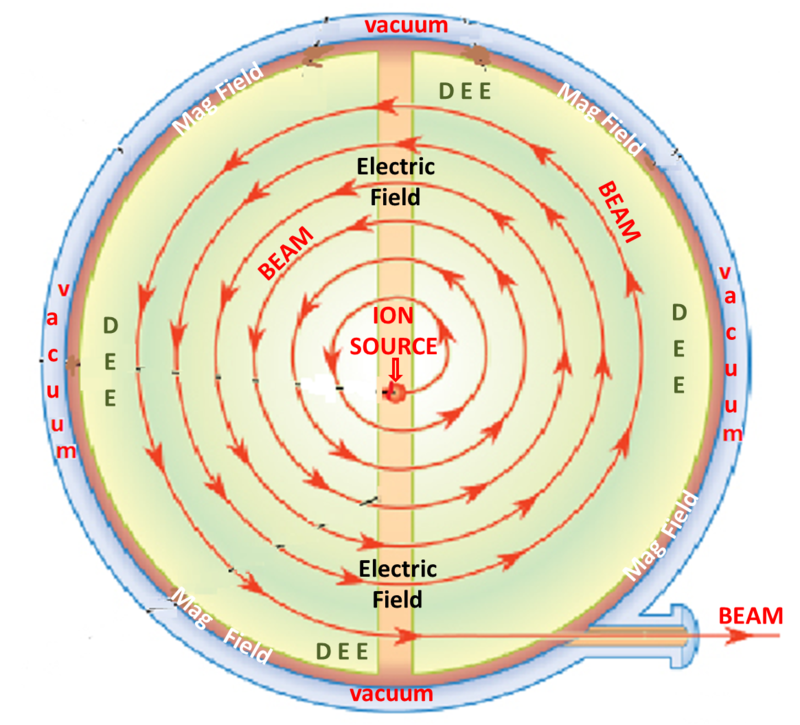 Due to their charge, ions can be contained and moved by electromagnetic fields. Magnets channel ions into particle accelerators to increase particles' velocity to near light speeds. TE assumes that water can be superheated, gasified, then transformed to plasma, collection of hydrogen(H+) and oxygen(O+) ions or perhaps even hydroxyl(HO+) ions. As mentioned in previous work, it's very likely that initial g-force vessels will use water supplies exported from Earth's oceans. 2. Injectors. After water becomes ions, they must enter the wave guide. 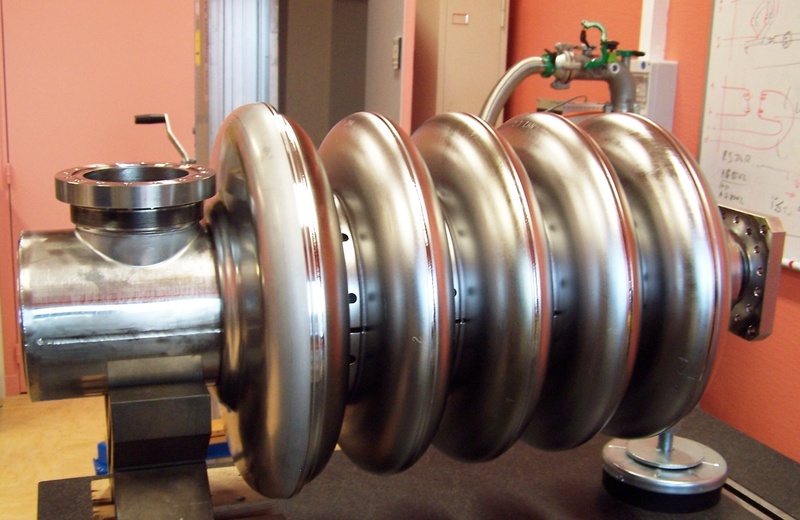 A typical injection process requires three types of magnets: cyclotrons, kickers and septa. 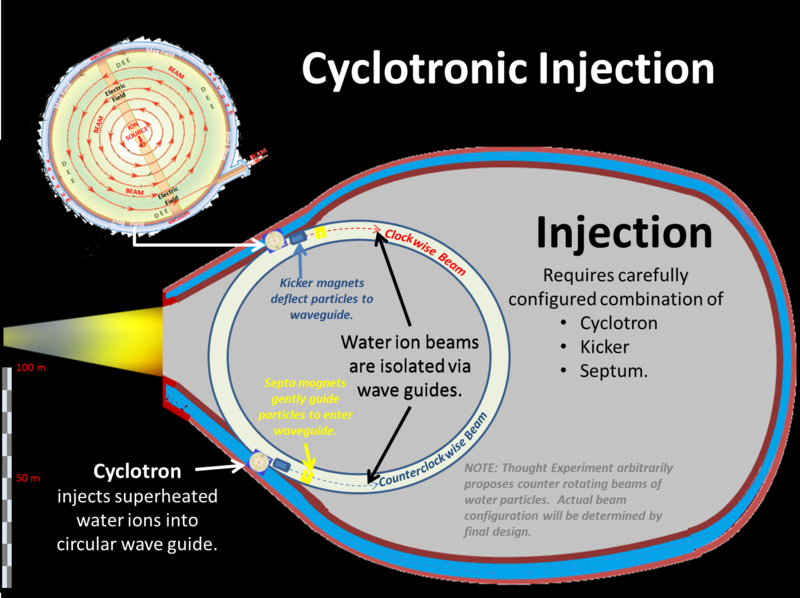 Cyclotrons provides the initial boost of speed. Historically, the cyclotron was one of the first particle accelerators; now, it is commonly used as an injector for much larger synchrotrons. A cyclotron has two D-shaped electromagnets (thus, "Dees"). A plasma source emits charged particles at the center of the cyclotron, and the magnetic field bends the ion's path into a constant velocity circle inside the Dees. To accelerate ions, the cyclotron uses a radio wave generator to alternate positive and negative electrical charges between the two Dees. As an ion circles around the cyclotron, it crosses the gap between the two D-shaped cavities. If the charge on the cavity in front of the ion is negative; then, the cavity behind it is positive; thus, the positive ion is compelled to move forward (attracted by the cavity in front and repelled by the cavity behind). As ions gain speed, their radii increase, and they spiral outwards. With proper timing, the ions always see a negative charge in front and a positive charge behind when it crosses the gap between the Dees. The resultant combination of forces accelerates the ions. Kicker magnets use pulsed magnets to inject ions into a storage ring. These magnets are driven by a high voltage modulator to produce magnetic fields with very fast rise and fall times (so that the field is only present when the bunch chosen for extraction/injection is passing, and not the previous or subsequent bunches). Timing injection is extremely important as well as beam release and storage duration. NOTE: Chang-Diaz's VASIMR "ion thruster" might make another excellent injector. In these large circular devices, plasma particles orbit in tightly controlled beams under the influence of magnets. The wave guide for the particles looks like a large thin torus (commonly described as a "doughnut shape"). However, the pipe uses straight sections between the bending magnets to achieve a circle like path, a polygon with rounded corners. A path of large effective radius may thus be constructed with many segments. 4. Magnets steer and focus the particle beams. Synchrotrons require many magnets of several types. steer the beams, a basic and necessary function. and particle beams must be "steered" for millions of orbits. focus the beams both vertically and horizontally. Bunches of accelerated, charged particles tend to spread over time due to the initial random motion of the particles and the natural repulsion between like charges. The spread will increase until particles hit the beam pipe wall and disintegrate. To control the spread, particle accelerator uses a 'lattice' of quadrupoles to focus both vertically and horizontally. The quadrupoles are of two types: 'F quadrupoles' (focus horizontally) and 'D quadrupoles' (focus vertically). If an F quadrupole and a D quadrupole are right next to each other, their fields completely cancel out. But if there is a correctly chosen space between them, they collectively focus in both horizontal and vertical planes. A lattice can then enable the beam transport around an entire ring. Quadrupole magnets affect lower energy particles more than higher energy particles; thus, quadrupole fields tend to exacerbate the longitudinal size of a particle bunch's transverse and longitudinal size. This phenomena can be described as a storage ring's chromaticity, (off-energy particles tend to further shift their position for a given "betatron" phase advance per orbit). Typically, this difference can be controlled with the addition of sextupole magnets to the lattice. Sextupolar fields' focal length is inversely proportional to the distance from the center of the magnet with which the particle passes. Within each bunch, most particles have reasonable energy offsets; a properly placed sextupole can be set at a strength to focus such particles to the same point for each bunch . This will negate the tendency of the quadrupole lattice to disperse the beam. each size supports a certain RF frequency. Radio frequency (RF) cavity is a metallic chamber with an electromagnetic field; charged particles gain velocity during each pass through the cavity. Cavity must be a specific size and shape for electromagnetic waves to resonate properly. Since the RF cavity field oscillates at a given frequency, timing is important. The ideally timed particle will see zero accelerating voltage. o If particles arrive early; they decelerate to fall back toward the ideal. o If they arrive late; they accelerate to gain on the ideal particle. distinct "bunches" about the ideal particles. Klystrons produce microwaves, electron beams. Thus, beams of negatively charged electrons attract and guide bunches of positively charged ions.Klystrons transmit power via a rectangular waveguide to each RF cavity. Electromagnetic fields are excited in the cavity by coupling in an RF source with an antenna. When the RF frequency fed by the antenna is the same as that of a cavity mode, the resonant fields build to high amplitudes. Charged particles passing through apertures in the cavity are then accelerated by the electric fields and deflected by the magnetic fields. At extremely low temperatures and magnetic fields, many elements "superconduct"; electricity flows with no resistance. EXAMPLE: Mercury superconducts at a temperature less than 4.2° K (Mercury's critical temperature, Tc) and a magnetic field less than .041 tesla (Mercury's critical mag field).. Furthermore, elemental superconductors have no thresholds. In our example, the element, Mercury, superconducts until just above critical values; then, it immediately gains back all its electrical resistance. Such elements are known as "soft" superconductors. "Hard" superconductors contain multiple elements (i.e. compounds and alloys). Hard superconductors have a magnetic critical field with a much greater threshold than "soft" superconductors with only one element. A typical "hard" superconductor is niobium-tin (Nb3Sn), which superconducts at 18° K in the absence of any significant magnetic field. Below a magnetic field of 0.01 tesla, Nb3Sn, fully superconducts. Above 29 tesla, it ceases superconducting entirely. Between these two threshold values, the material is in a "mixed state". Part of it has electrical resistance, and the other part superconducts. Thus, hard superconductors can sustain superconductivity in the presence of much higher magnetic fields than soft. Space borne particle accelerators would definitely perform better with hard superconductors; however, availability might become an issue. A material’s superconductivity is vulnerable to both temperature and magnetic field. The strength of the magnetic field required to break the material’s superconductivity is the critical field. Certain superconducting alloys are now considered the best for superconducting windings. Low-temperature superconducting magnets are made from niobium-tin (Nb3Sn) and/or niobium-titanium (NbTi). Niobium-titanium is cheaper and less fragile, but niobium-tin produces a higher magnetic field. Both types are often combined in the same magnet. Solid State Diffusion: To create a superconducting alloy, heat niobium and tin filaments at 700° C. Tin melts and diffuses into the niobium. The resulting alloy will superconduct after its temperature drops to near absolute zero. With no electrical resistance, superconductors are now essential for electromagnets in particle accelerators. Onboard a spaceship with limited resources, the energy savings from superconductors will be critical. Ordinary electromagnets (i.e., "resistive" magnets) would require enormous power. Typical synchrotron has many sophisticated, powerful electromagnets; each magnet has perhaps a kilometer of electrical cable; each cable has hundreds of millimeter diameter wires. (Each wire is about as thick as a paper clip wire and contains micrometer-thin filaments no wider than a human hair.) These numerous tiny filaments greatly increase the total surface area to quickly cool the heated magnet and stabilize the magnetic field. Thus, thousands of filaments wind into wires, and hundreds of wires combine to create a thumb sized cable. 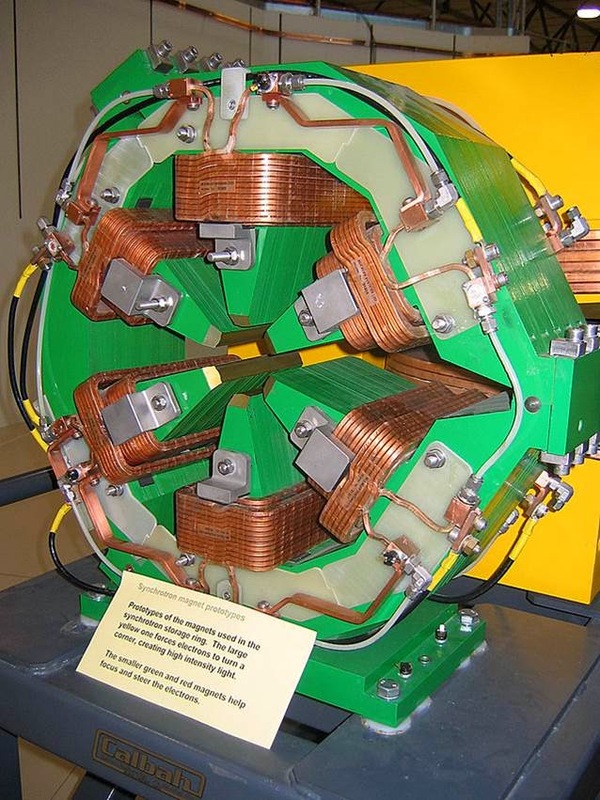 The two types of superconducting electro-magnets are CICC and WW. CICCs efficiently cool directly from the inside out. Even with tightly packed wires, there remains plenty of room for liquid helium to flow through and provide a low-temperature environment for wires to superconduct. o CICC magnets quickly turn off/on. Changing magnetic fields produce heat, but CICC magnets can handle heat due to liquid helium immersion of windings. o CICC magnets are very flexible. They can combine with resistive magnets to form hybrid magnets, together creating a magnetic field that neither the superconducting magnet nor the resistive magnet could achieve alone. Wire-Wound (WW) magnets maintain low temperature with 100 layers of insulation.. Completed WW magnet goes inside a cryostat to keep the magnet cold enough to superconduct. Thus, WW magnets don't need liquid helium inside the cables. o WW magnets ramp up very slowly to stay cool. With coolant on the outside, internal windings can't handle the heat from a changing magnetic field. o WW magnets provide an uniform field with no power requirements. After ramp up, WW magnets disconnect power, but superconducting continues for an ultra-smooth current; thus, an ultra-smooth, consistent magnetic field precisely controls particles' path for a very long time. Thought Experiment assumes on board accelerators will use both types. However, vast majority of space borne superconducting electro-magnets will be Wire Wound (WW). WW magnet easily maintains same size mag-field. Typical cavity coating material is pure Niobium with a critical temperature of 9.3° K and functions as a superconductor nicely in a liquid Helium bath of 4.2° K.
TE speculates SRF material of choice might someday become a "hard" superconductor such as the Niobium-Tin (Nb3Sn) alloy now used for superconductor magnet windings. Nb3Sn's critical temperature of 18° K would work well with a bath of liquid Hydrogen (about 14° K). TE assumes that liguid Hydrogen will be easier to acquire than liquid Helium..
Superconducting radio frequency (SRF) technology applies electrical superconductors to radio frequency devices. Minuscule resistance allows SRF resonator to obtain an extremely high quality factor, Q, with very low loss and narrow bandwidth. High Q cavities enable high-performance particle accelerators. SRF cavities' resonant frequency typically ranges from 200 MHz to 3 GHz, depending on the particle species to be accelerated. Accelerators typically use resonant RF cavities coated with superconducting materials. The most common fabrication technology stamps thin walled (1–3 mm) shell components from pure niobium sheets and then welds these shell components together to form cavities. a) High Duty Cycles. SRF cavities excite electromagnetic fields to much higher levels than possible for resistive cavities; copper cavities would melt at such levels. b) Larger Particle Beams. The low electrical loss in an SRF cavity enables large beam pipe apertures with a high accelerating field along the beam axis. c) Efficient Power Transmission. SRF power goes to beam particles not to the cavity walls. With negligible RF power dissipated in the SRF cavity walls, RF sources need only maintain the particle beam power. A storage ring is an evacuated pipe passing through a ring of magnets. charged particles can then circulate in the ring indefinitely. in fact, a storage ring is basically a synchrotron without the RF cavity. however, particles could orbit for hours until extracted. There's plenty of vacuum in deep space. "In a poor vacuum, circulating particles frequently bump into air molecules." 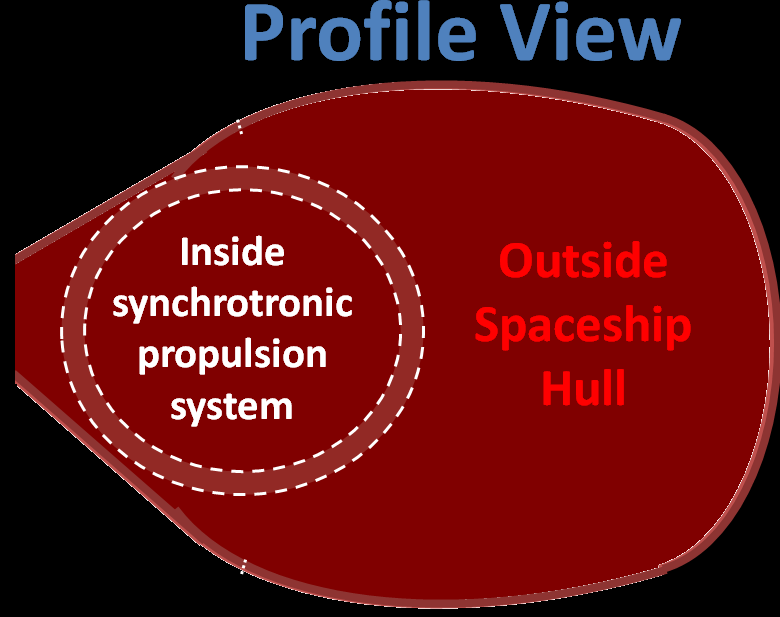 As the particle bunches travel many thousands of kilometers (near the speed of light for many hours), any residual gas in the beam pipe will cause numerous collisions to take particles out of the propulsion path. Therefore, a better vacuum produces better propulsion performance. Fortunately, air molecules are rare in space; thus, vacuum requirement will be easier to implement in our spaceship than on Earth. to extreme cold and complete vacuum. When doors close, the resulting seam could retain well designed gaps to maintain a constant vacuum. 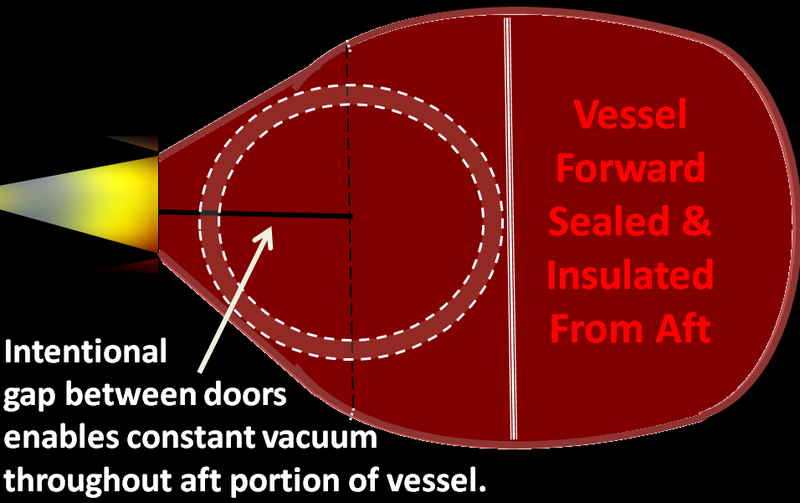 Forward portion of vessel needs a seal to retain its Earth like atmosphere. It needs insulation to protect against the inevitable synchrotron radiation due to numerous turns taken by numerous particles. NOTE: Vacuum is a good isolator; so, the deep space temp of 3° K might not directly benefit the super-coolant needs of superconductors. However, it might indirectly benefit by facilitating gas liquefaction. For superconductivity, liquefied gases supercool the electro-magnetic materials. Superconductors operate best in extreme cold best described by the Kelvin temperature scale where 0°K = -273°C. Thus, water freezes at 273°K and boils at 373°K. such magnets can produce higher fields with much less power than conventional magnets. Outer space has an unlimited supply of extreme cold (about 3° K). Designers can quickly liquefy gases via direct exposure to ambient space. Liquid Helium: Helium (He) liquefies at 4.222°K (​−268.928°C), lowest temperature of any element. Thus, it is best suited for superconducting coolant. Helium is relatively rare on Earth, although commercially available by extraction from natural gas. TE assumes that long term export of He from Earth is not practical and that other coolant sources should be considered. It is possible that He isotopes (³He and 4He) might one day become plentiful through mining operations on Luna and the Gas Giants (Jupiter, Saturn, Uranus, Neptune). Till then, it might be good to consider other supercooling elements. Liquid Hydrogen: Hydrogen liquefies at 20.27°K and remains liquid until 13.99°K. Recall that a "hard" superconductor has critical temperature above 14°K. EXAMPLE: the Niobium-Tin (Nb3Sn) alloy has critical temperature of 18°K which would work well with a bath of liquid Hydrogen (about 14° K). 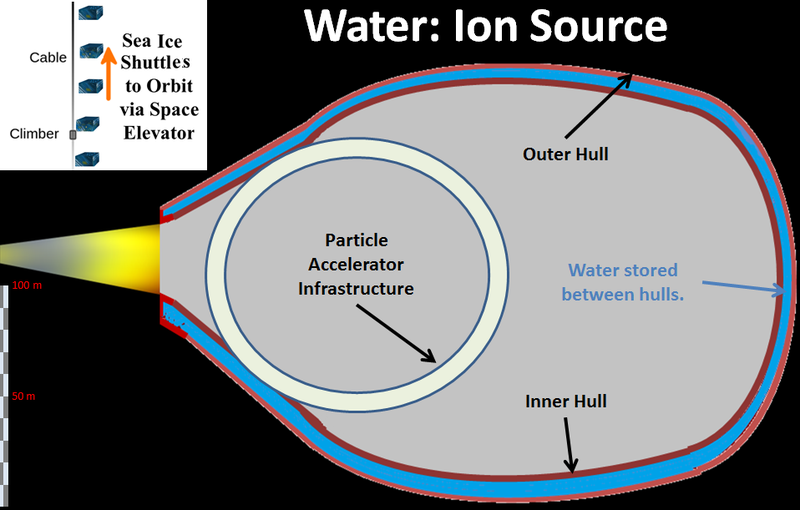 Space borne facilities might someday use water electrolysis to create quantities of gaseous hydrogen (H2) which could be liquefied via direct exposure to the extreme cold temperature (3° K) readily available in ambient space. Liquid Oxygen: Same electrolysis which produces hydrogen from water also produces Oxygen gas (O2). It becomes liquid oxygen ("lox") between 54.36°K and 90.19°K which is much too warm for Nb3Sn to superconduct. Unless critical temp of some superconductor is significantly increased, lox probably won't used be used as a supercoolant; however, there will likely be some other use for lox on space vessels. Liquid Nitrogen: Nitrogen (N2) is in liquid from 63.15°K through 77.35°K. Like O2, N2 is plentiful on earth and not the best supercoolant. However, Nitrogen is an essential building block of amino and nucleic acids, essential to life on Earth and an essential part of the atmosphere. Though plentiful on earth, it's also plentiful on other planetary objects and might have to be "mined" from other planets/moons (i.e., Titan) for use in space vehicle's atmosphere. Perhaps available for liquefaction for use as onboard refrigerants if not for super-coolants. Observe collisions; learn how to avoid them. they accelerate particles to create and observe collisions; thus, detectors. Space borne accelerators must be much more practical. Accelerate particles to max momentum with minimal collision loss. Thus, detectors must alert operator to all collisions. Many earthbound accelerators use detectors for scientific experiments to investigate the internals of atomic scale objects. However, space borne detectors are not there to watch for experimental collisions but as a design feature to monitor and minimize collisions. Thus, particle detectors must monitor and record the results of particle collisions. With fewer particle collisions, more particles exit exhaust portal to contribute to exhaust momentum; thus, better propulsion performance. o Vertex detector - detects particle tracks. o Drift chamber - detects particle positions at several points along their tracks. Curved tracks reveal the momentum of the particle (related to its mass and velocity). Our notional spaceship would use its accelerator and its storage rings in a slightly different way. Since the ship's accelerator is part of the propulsion system, its purpose is to prepare high speed particles for discharge from the vehicle for an advantageous momentum exchange. Since momentum depends on mass as well as velocity, propulsion would gain from heavier particles being expelled; thus, the storage rings would concentrate on heavier ions and for ways to optimize their storage. 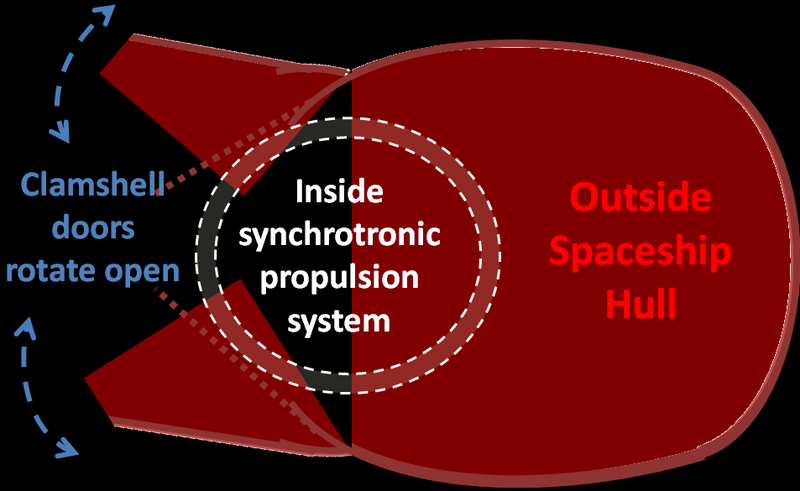 MAJOR DISTINCTION: For g-force propulsion, spaceship accelerators need minimal particle collisions. Objective: Maximize propulsion efficiency; thus, minimize collision loss. deflect a portion of the main particle beam out of the ring. Septum magnets guide them toward the exhaust port to become part of the exhaust stream.. Combined force of all these near light speed particles cause constant momentum exchange to increase velocity of very large space ship ten meters per second for every second of powered flight. Electron beams further control exhaust particles. Thought Experiment proposes klystrons at exhaust ports to focus exhaust particles. was constructed by Cockcroft and Walton. It was a voltage multiplier that used an intricate stack of capacitors connected by rectifying diodes as switches. By opening and closing switches in proper sequence they created a potential of 800 kilovolts from a transformer of 200 kilovolts. They used this potential to accelerate protons down an evacuated tube eight feet long; they made history. John Cockcroft was eldest of five sons of a Yorkshire miller. He won a scholarship to study math at Manchester Univ but become greatly interested in atomic physics after reading work by J.J. Thompson and Ernest Rutherford (then at Manchester). His studies were interupted by WWI, he was sole survivor of a unit caught in bitter fighting on Western Front. After completing a EE degree from Manchester, he joined Metropolitan Vickers Company and eventaully went to Cambridge to improve his math. He again met Rutherford who took him into famous Cavendish Lab. Ernest Thomas Sinton Walton was born in County Waterford, Ireland. The son of a Methodist minister, he went to Methodist College, Belfast in 1915 where he excelled in math and science. In 1926, he graduated from Trinity College Dublin. In 1927, he went to Cambridge University to work for Lord Rutherford at the Cavendish Lab. Walton was awarded a PhD in 1931. Electrostatic Accelerators. The first particle accelerators used a single static high voltage to accelerate charged particles. Widely used today, they are more suited to lower energy studies owing to the practical voltage limit of about 30 MV. Several such devices can be connected in series to further accelerate the particles. Linear Accelerators (LINACs) use oscillating electric fields to accelerate particles in a straight line. LINACs perform much better than electrostatic accelerators, but they have obvious limitations. Particles can enter at one end; accelerate a certain amount; finally, exit or impact at the other end. Particles cannot cycle because LINACs are not circular. Cyclotrons were the earliest operational circular accelerators; a cyclotron is a large dipole magnet with a constant magnetic field. In such a field, a radio frequency (RF) power source drives the charged particles to orbit at a constant “cyclotron frequency”. The particles start circling near the center of the magnet and spiral outwards as they gain energy; they eventually exit at the outer edge as they attain their maximum energy. They often provide an initial low-energy kick to inject particles into circular accelerators. Cyclotrons were invented in 1929 by Ernest O. Lawrence at the University of California, Berkeley. The first cyclotron was only 4” (100 mm) in diameter. In 1939, he built a machine with a 60” diameter pole face and planned one with a 184” diameter in 1942. Like LINACs, cyclotrons have their own limits; increasing particle's velocity increased their turn radius (resulting in particle's spiraling path, typical of cyclotron); so, they soon had to exit the device. Eventually, particle accelerator devices were developed which were neither linear nor spiraling; instead, particle paths could orbit indefinitely. However, both LINACs and cyclotrons are now used as "feeders" for much more powerful accelerators. Decrease turning radius, increase accelerator's magnetic field. Increase turning radius, increase accelerator's electrical field. 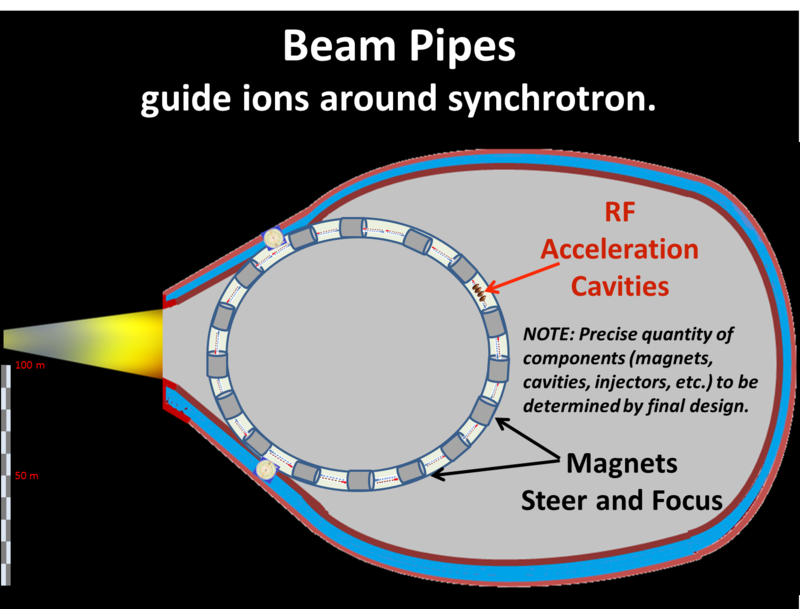 Synchrotron is an evacuated beam pipe encased in hundreds of magnets; synchrotron design assigns several functions to distinct magnet groups. It uses RF power sources to accelerate ions to near light speed, c, in a constant radius ring. RF amplitude cycles cause the particles to form “bunches”, which regularly extract to an external beam. A synchrotron is an advanced, cyclic particle accelerator which synchronizes the magnetic field (turns the particles to circulate in numerous orbits) and the electric field (to accelerate the particles) with the traveling particle beam. While the overall shape is circular, the synchrotron is divided into many straight sections of beam pipe between specified bending magnets. In these straight sections, look for other devices such as RF power modules, focusing magnets, extractors, injectors, detectors, etc. Synchrotron’s overall placement of devices is often called a “lattice”; the lattice design has developed into an entire discipline, "beam physics" or "beam optics". In retrospect, it turns out that to split the atom, they needed a high speed, proton stream. Such a stream required a "high voltage generator", C&W co-invented the high voltage generator; they scoured the countryside for discarded glass sight tubes from petrol pumps which they stacked to form the acceleration tube. They used this apparatus in 1932 for the momentous experiment of accelerating protons. This was a remarkable feat, but this achievement alone would not have secured their place in science history which they now hold.C&W were the first scientists to literally split an atom into two equal parts. By stripping electron from hydrogen atoms, they used the high electrical voltage to accelerate the proton ion into a stream of near light speed protons. They first "split" the atom by bombarding lithium with a proton stream. Thus, a very few of the billions of protons encountered a lithium atom and caused it to break into two helium atoms. Thus, they were able to transmute lithium into helium. After this Nobel winning accomplishment, both Cockcroft and Walton went to distinguished scientific careers. Cockcroft and Walton led the Cavendish effort to build the first effective particle accelerator. However, they were one of five scientific teams vying to accomplish this impressive task. At Cambridge's Cavendish Labs, Cockcroft and Walton accelerated hydrogen nuclei to ever higher speeds via a potential of 300,000 volts. These particles were shot through tubes and pipes into collision with lithium foils as final target. Subsequent trials used other metals as final target. At the Univ. of California, Ernest O. Lawrence used a "cyclotron", a small circular accelerator. At CalTech. Pasadena, Charles Lauritsen raised 750,000 volts via AC equipment from Southern California Edison. A Swiss engineering firm, Brown Boveri, sponsored two Germans, Arno Brasch and Fritz Lange. In 1927, they tried to harness lightning in the Swiss Alps. Unfortunately, this effort tragically cost a life of another partner, Kurt Urban. Thereafter, they worked inside the Kaiser Wilhelm Institute in Berlin. For proton synchrotrons, the high energy limit is set by the strength of the bending magnets. For a given bending magnet strength, higher energies can be achieved only by making the radius larger. The largest proton synchrotrons are the Main Ring (500 GeV) and Tevatron (1 TeV) at Fermilab and the Super Proton Synchrotron (SPS, 450 GeV) at CERN. Particle speed is typically limited by the strength of the magnetic field(s) and the minimum turn radius of the particle path. Since the radius is fixed by the infrastructure, the strength of the magnetic field is the real parameter of interest. For an ordinary (not superconducting) electromagnet, the field strength is limited by the saturation of the magnetic cores, and the fields cannot increase to any practical extent. Accelerated charged particles lose energy due to emission of photons (light). The limiting beam energy is reached when the energy lost to the lateral acceleration required to maintain the beam path in a circle equals the energy added each cycle. More powerful accelerators are built by using large radius paths and by using more numerous and more powerful microwave cavities to accelerate the particle beam between corners. Electrons and positrons lose a significant fraction of their energy when turning; however, heavier particles (protons or ions) aren't as affected by this limitation. Thus, a synchrotron constantly adjusts both the electic field and the magnetic field (much simpler cyclotron keeps both static). By adjusting these parameters as the ions gain energy, particles' path stays constant as they accelerate. Major accelerator facilities use linacs and cyclotrons as initial stages and synchrotrons as the final acceleration stages. Particles accelerate due to radio frequency (RF) electric fields at RF cavities along this same circumference. Magnetic fields must increase in synchrony with the RF induced acceleration to keep the particles on the constant radius path. Such accelerators work with charged particles such as protons or electrons, and even with heavier positive ions. Thus, the wave guide for the particles will likely be a large, doughnut shaped torus. Current technology synchrotrons can produce a pencil-thin beam of particles with over 100,000 times the energy of the most energetic natural radioactive emission. The highest performing accelerators make huge use of superconducting cryomodules, superconducting magnets and superconducting RF cavity resonators. Plasma Source Transform water into ions for acceleration. o Export water from terrestrial . Injector Puts ions into wave guide. Rate determined by ship's mass. Beam Pipe vacuum tube provides path for particle beam. Design determined by size/shape of ship. Magnets steer and focus the particle beam. Design determined by size/shape of ship. RF Cavities generate microwaves for the particles to ride. Required for particle acceleration. Superconductors Save enormous energy Required for magnet practicality. 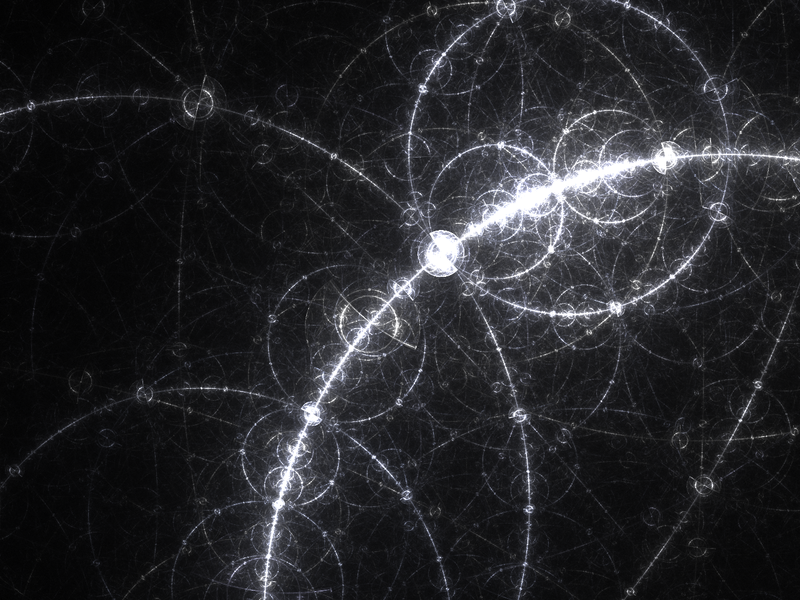 Storage Rings orbit particles until extraction. Key design factor. Vacuum System keeps wave guide completely clear. Plenty of vacuum in deep space. Cooling System removes heat generated by equipment. Plenty of cold in space (4° K); can make liquid hydrogen from water supplies. Detectors examines radiation from particles colliding with each other and with walls of wave guide. Needed for efficiency as well as safety concerns. Not easy to repair wave guide, even harder during powered flight. Extractor Puts ions into exhaust ports. Rate determined by efficiency. I found that the 1973 Soviet conference on CETI (Communication with Extra-Terrestrial Intelligence) included papers about studies of ion-drive interstellar probes. They concluded that with then-current technology, ion-drive starprobes capable of reaching 5% of c, the speed of light, were feasible (such probes, which would depart from Earth orbit, would be about the size of a Saturn rocket). If that was feasible with 1973 technology, what might be feasible with today’s ion propulsion (and Hall Effect thruster) technology?